Ride over 400-miles in your next 32 workouts, and never see the same terrain twice! This could be your best preseason ever! HR strap ships within 24 hours. HR watch ships within 24 hours. Ride the Rockies: Join 2,000 people in a cycling tour of Colorado. Ride 400-miles through towns like Aspen, Gunnison, and Leadville. Experience the famous Independence Pass. Ride through Rocky Mountain National Park over Trail Ridge Road. With 32 legs this series alone can be your entire preseason conditioning. 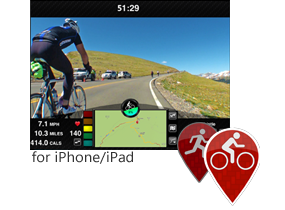 The Ride the Rockies Virtual Experience give you ownership of the entire 2012 Ride the Rockies Series on FitTrip. You'll have it forever, regardless of membership. You also get a 1-year subscription to FitTrip that enables you to download and experience the entire FitTrip trip library for a limited time. "FitTrip has become a staple of my bike training arsenal." FitTrip is an interactive iPad (or iPhone) app that creates the virtual experience of trips such as riding through France, hiking in Patagonia, or going on an adventure in Utah. The Feeling of the terrain and unwinding of the trail linger even after the workout is finished. With FitTrip, part of your mind is always exploring some corner of the planet. 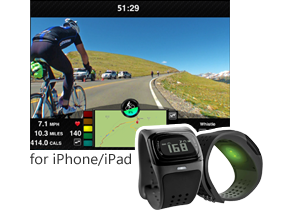 "FitTrip elevates your workout and makes it an adventure by synchronizing real course video with your heart rate." 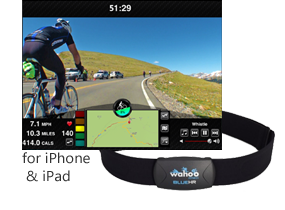 FitTrip uses your heart rate to create an interactive experience of trails and roads. Your heart is essentially connected to your machine. So we connect FitTrip to your heart, and leave your machine alone. This little twist frees you to use any machine without complicated or expensive equipment. FitTrip's interaction is powered by studies on the human body and physics as applied to fitness. Users perform a short calibration on a treadmill. After that, the speed prediction is typically within 1-2 MPH of the speed you would be going if you were there in person. Join 2,000 friends on the celebrated Ride the Rockies Tour (2012). This tour starts in Gunnison, which became the post-Tombstone home of famous cowboy Wyatt Earp. You'll be riding below sage brush covered mesas from Gunnison to the Blue Mesa Reservoir. This is a time to warm up the legs for the 6 days and 440 miles to come. Leg 2 runs along the Blue Mountain Reservoir, one of the longest bodies of water in Colorado. The area is filled with beautiful mesas, deep narrow canyons, and fjord-like lakes. Leg 3 parallels the Black Canyon in the Gunnison National Park. The Black Canyon is named for its steepness, which makes it difficult for sunlight to penetrate very far down the canyon walls. This road travels along the northern edge of the rim with occasional peaks into the depths. Leg 4 parallels the lower section of the Black Canyon, and begins to climb higher above the Gunnison River. What started as an easier day now turns into a moderate climb as you head toward lunch. Leg 5 takes you to Crawford, a small town where the Old West is very much still alive. Cowboys are known to run cattle drives right through the middle of town. This is the home of the famous singer, Joe Cocker. While this section should be an easy downhill, headwinds will have you battling for your progress. Leg 6 brings you to Hotchkiss and the end of the first day of the 2012 Ride the Rockies. Semi-trailers await riders with their bags. You'll be staying at the local public school and camping in the football field. Grab a shower at the trailer and head down to the fairgrounds to celebrate your first day with a victory beer. The first stop on RTR day 2 is Paonia. This area was Ute land until 1880, making it one of the last areas of Colorado inhabited by the American Indian. It's now a quaint town nestled among the Rockies and host to a half dozen small summer festivals. You're riding along highway 133 through one of the lesser-traveled areas of Colorado. Enjoy the quieter views of the western Rockies. The road is largely empty and the ascent is mild. You are just getting your legs under you for this trip. The mind checks in on the body, knowing that the first real test will be tomorrow. This section follows highway 133 to McClure Pass. Located on the western side of the Elk Mountains, this pass hits 8% grade and reaches an elevation of 8755 ft.
Tearing down McClure Pass you are going to shoot past the turnoff to Marble, the quarry which yielded the perfect white marble for the Lincoln Memorial. Then follow the Crystal River to Redstone, a quaint town favored by locals as an artistic community and quiet getaway. You are headed to Carbondale. Located a half an hour from Aspen, this historic town sits at the confluence of the Roaring Fork and Crystal River. Pull into Roaring Fork High School (your camp for the night) pitch your tent, and catch the shuttle to the center of town for some good food and music. Tomorrow Ride the Rockies gets hard. This is going to be a big day! Wake up early. It is cold and the sun won't hit you for a while yet; but with Independence Pass looming ahead there is no time to loose. Grab a coffee; there is a vendor famous for his pancakes at the end of the first leg. The mountain air is cold today. Even with full gloves your fingers ache. The second leg of the day follows the Rio Grande Trail, which is a former railway. It has since been transformed into a mostly-paved bike path connecting Glenwood Springs to Aspen. Look at the morning light coming through the leaves as you work out any kinks before getting into the more serious climbing ahead. On this leg you will be transitioning to the ascent of Independence Pass. The Rio Grand Trail turns to dirt for a number of miles, which is always interesting on skinny tires. Then pass Aspen and begin to climb. You are ahead of the majority of the pack; and all 2,000 of you are wondering how the legs will hold up on these coming sections. Independence Pass has begun. Averaging over 5% gradient and at times reaching 10%. You'll be climbing slow and steady up around some narrow curves and through the trees. The Roaring Fork River rushes just out of sight below as you ascend to up over 10,000 feet. Now you climb to the top of Independence Pass. Snow clings to the alpine tundra as you break through tree line. You will be topping out at 12,095 feet. Aspen is behind you and Leadville lay many miles ahead. Lunch is as much of a celebration as it is sustenance. The DJ is holding silly contests and the mood is giddy. But before you reach this mountain-top oasis you must climb. Your last two legs have been big climbs; and now you lose that elevation on a fast and beautiful descent. At the top you are cold in the alpine air, but by the bottom you will be sweating again. It has been a big day, one of the biggest on the tour, and Leg 7 is the final stretch from the bottom of Independence Pass to Leadville. The route is punctuated by dirt roads and the call for camp. Leadville was the famed home of the Unsinkable Molly Brown, one of Doc Holiday's last shootouts, and host to the Leadville 100. The start of Day 4 brings with it the furthest day of the tour. You will be crossing two passes and travel nearly a full century ride before you're done. To begin, climb up Freemont Pass. You are now on the Continental Divide, which is the ridge that determines whether rainfall channels into streams and rivers that ultimately hit the Atlantic (East) or Pacific (West). There is a double-summit here, so your climbing isn't quite done yet; but soon you will be flying down towards I-70, the corridor famous for many of the World's best-known ski resorts. Today brings you a little of everything: Legs 1 and 2 gave you a climb and then descent. Leg 3 is a playful meandering around the Dillon Reservoir packed with twists and turns to keep your mind of the fact that you have a long way to go before you'll be done. You are the base of the dam for Dillon Reservoir, which resumes as the Blue River. You'll be cycling alongside it until you turn towards the second pass of the day: Ute Pass. This is a long section and lunch waits for you at the top. Steady pacing is the key. Be careful of vehicles on the narrow road here. What appears desolate can lead to trouble. You'll complete the leg a nice road along the Colorado River. The stop is in Hot Sulphur Springs, and quaint town with a history worth reading about. What a haul today has been! Yesterday was Independence Pass and tomorrow is Trail Ridge Road. This is was the longest day, and by the end of it you'll be ready for camp! This is the lower portion of Rocky Mountain National Park. Huge green fields sit to the left as your make your way deep into the park. To the right is the mountain that you will be climbing shortly, and in doing so you will cross the Continental Divide for the second time this Tour. Begin your climb up to Trail Ridge Road. Ponderosa Pine lines your path as your climb up to Milner Pass. This is not the highpoint of today's ride, but it is the Continental Divide. You end at over 10,000 feet. But wait - there's more. This is only the first half of today's big climb. This is the final ascent to Trail Ridge Road. You'll be breaking tree line and riding above 12,000 feet! As the last big climb of the RTR series, this is the time to give it everything you've got left. Many-a-rider hoists their bike high above their head as a sign of victory after completing this climb. The last leg of the day. Cross Trail Ridge Road and descend to Estes Park. TRR is the highest continuous paved road in the United States. To your left is a view of Wyoming, and on your right is Long's peak and other spectacular mountains. Elk are frequently spotted up here in herds that number in the hundreds. Last day! You have been re-routed due to an ongoing forest fire along the planned route. Ride through Estes Park and head east. About half of this ride is a gradual climb, but then you descent quickly down canyon roads and are headed for flatter terrain and the final stretches. This leg takes you out of the mountains and onto the "Front Range", which is how locals refer to the eastern most edge of the Rocky Mountains. You have been largely descending since yesterday's summit of Trail Ridge Road. By the end of this leg you will be 35-miles directly west, and over 7,000 feet below that high point. You finish in Loveland, a small town which has grown world-renown for its bronze sculpture. This is it! You have pedaled hundreds of miles and are now on the home stretch. You are heading straight north up to Fort Collins. The Rockies sit a few miles off to your left. This is the home of Colorado State University. It is also the home of the Odell's Brewing Company, which is the location of your finish line! No need to sprint here. Instead riders linger together on the last miles of an eventful, strenuous and glorious week. Once you Ride The Rockies, you are forever touched by its magic. Congratulations!